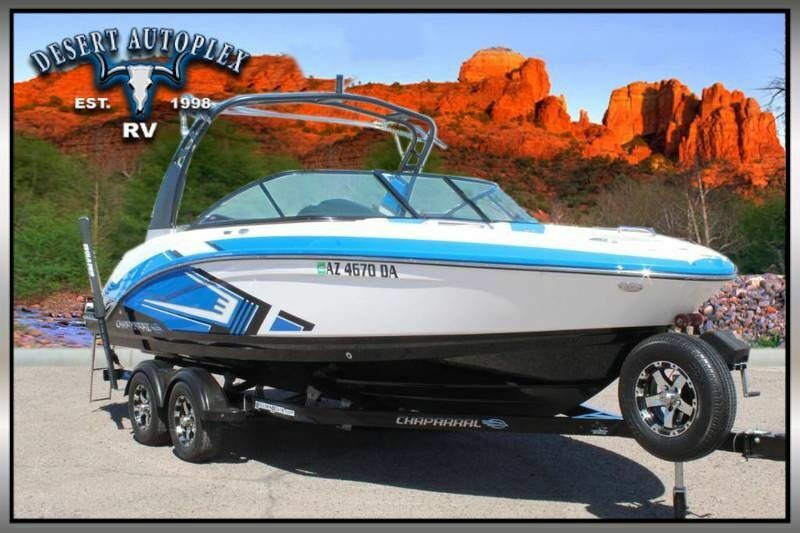 Desert Autoplex is pleased to bring you this extra clean 2017 Chaparral VRX 223 Open Bow Jet Boat! This boat is outfitted with twin Rotax 4-Tek motors. This boat has been through a detailed service and inspection and is ready to go! This boat starts and runs perfect with absolutely no issues. The vinyl interior is in extra clean condition showing no signs of abuse. The exterior of this boat looks excellent with no damage or signs of abuse. This boat is perched on a dual-axle trailer with a set of premium alloy wheels. We have done a complete annual service and inspection on this trailer and it is in excellent condition. This boat has also just had a complete service done and it is ready to go to the lake and enjoy!! Absolutely no disappointments with this stunning open bow boat. Don't miss your opportunity to own this extra clean 2017 Chaparral VRX 223 Open Bow Jet Boat. Financing is always available on approved credit. We offer a secure online credit application for fast and easy credit approval.